Clean & Safe temporary floor protection is among our most popular products for interior floor protection. Made from soft recycled fibers and a plastic lined backing, Clean & Safe offers high foot grip and water resistant floor protection. 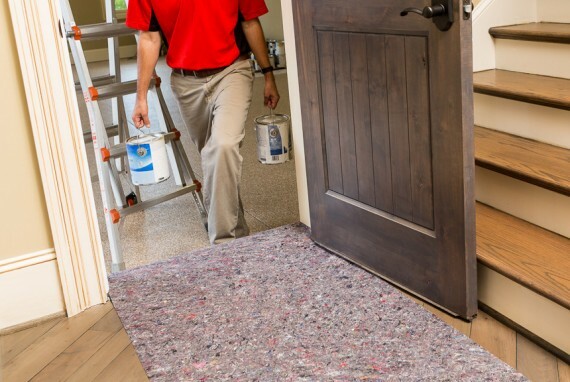 Ideal for painters, interior finish work, and home showings, Clean & Safe is the best reusable floor protection on market. Unlike most floor protection products, Clean & Safe is water resistant. This ensures that no paint, staining solutions, solvents, oils, or any other construction byproducts ruin new floors. For this reason, Clean & Safe is our most popular hardwood floor protection for remodeling projects. Contractors and DIY homeowners alike rely on Clean & Safe for all of their floor protection needs. Each reusable 40″ x 164′ roll covers a total of 547 sqft.Because Clean & Safe is a reusable product, one roll is often adequate for an entire home’s worth of work. While hardwood is the most commonly protected floor by Clean & Safe, it can be used on everything from concrete to low-pile carpeting. This entry was posted in Product Testimonials, Surface Protection, Uncategorized and tagged Clean & Safe, clean & safe floor protection, floor protection, hardwood floor protection, waterproof floor protection by admin. Bookmark the permalink.